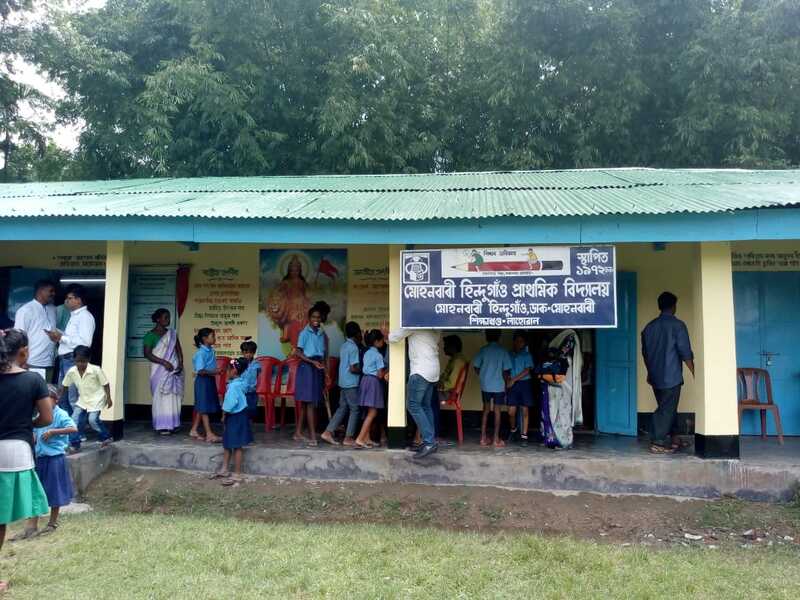 Mohanbari Hindu Gaon prathamik Vidyalaya, situated at Lahowal in Dibrugarh district on Monday got electricity. The school which was established in 1972 was in a dilapidated condition and without electricity. Recently, Dibrugarh Round Table Chartered, an NGO under Round Table India adopted the school and developed the whole infrastructure of the school. Dhruv Dalmia, National president of Round Table India on Monday inaugurated the newly renovated school. Dhruv Dalmia said, “Today I am very happy to see the smiles among the children’s. The school which so long has been in a deplorable condition has thoroughly been renovated, electricity has been provided with modern class room infrastructure. The small school children’s who have so far been deprived of the requisite congenial educational environment got new renovated classroom,”. He said Round Table India has constantly worked in the field providing infrastructure for educating the underprivileged children with the motto of “Freedom through Education”. “Since 1997-98, Round Table India has built 6189 classrooms in 2588 schools with an outlay of 244.65 crores impacting the lives of over 6.80 million under privileged. Its projects are mainly in remote areas where Knowledge is most needed,” said Dalmia. He added that last week they have got ‘Rising star power brands award for their work for underprivileged students. The school has 100 children and two teachers. For many decades the school has been running with two teachers. Nalin Khemani, Chairman Dibrugarh Round Table said, “We hope that the renovated school block will add to spread knowledge among the school going children of the area and make a positive impact in the lives of the underprivileged children and make the little stars shine bright,”. He said in Assam 11 projects of Round Table India were started for the improvement of infrastructure development of schools. Khemani said that the village people have helped them a lot in the project. “We thanked all the village people for their support. Our next project is ‘employment exchange, we will tie up with the corporate houses and try to provide employment for the passed out students,”. He said they have dedicated the school to former Prime Minister Atal Bihari Vajpayee. Khiru Saikia, assistant teacher of the school expressed his happiness and thanked the Dibrugarh Round Table for its initiatives for the development of the school. “We lack in basic amenities but we are hopeful that in coming days our school will develop,” Saikia said.